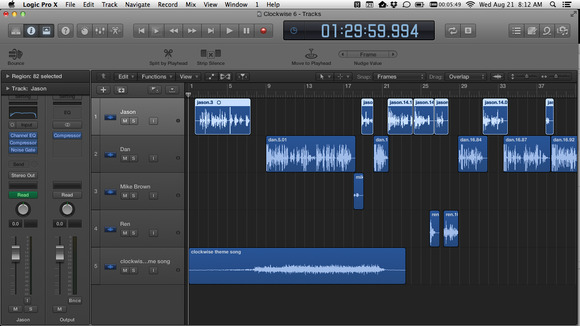 Logic Pro X: The right tool for podcasters? Earlier this year, I switched from GarageBand to Logic Pro 9 for editing podcasts. The result was a huge boost in productivity, even though I use only a tiny fraction of the functionality in Apple’s higher-end audio program. When Logic Pro X arrived, I was intrigued to read about its new features, but wasn't sure they'd matter to me because they seemed to be (understandably) focused on music creation. Would a crazy person like me, who has adopted this music tool for the non-musical business of producing spoken-word audio, benefit from upgrading to Logic Pro X? After editing several hours of podcasts with Logic Pro X, the answer is a qualified yes. Logic Pro X’s improved interface is easier to use than its predecessor's, and makes it much easier for novice users to discover the program’s many complex features. It’s not so much that Logic Pro X has a lot of features that Logic Pro 9 didn’t, but that it exposes those features more consistently and more logically. Logic Pro 9 menu bar. Logic Pro X menu bar. This isn’t to say that Logic Pro X is suddenly super easy-to-use. It’s not. It’s a dense and complicated professional app that will be intimidating to any novice. It took me three false starts before I finally dove in and began editing all my podcasts with it. I suspect that some of those false starts could have been avoided if I had been using Logic Pro X at the time instead of Logic Pro 9, though—it’s definitely friendlier. What’s funny is that since I’ve started using Logic Pro X, I’ve uncovered numerous features that were there before—I just didn’t know about them. Typing I to toggle the inspector on and off has been there all along, but I only just discovered it. Likewise with typing A to display automation. The toolbar is now customizable on a per-document basis, so I can vary the contents of the toolbar based on my needs for a particular project. The new Track Stacks feature lets me simplify my interface by grouping certain tracks together. This isn’t a big deal with simple podcasts, but for larger productions (like a radio drama I edited earlier this year), it can be really useful to isolate a bunch of tracks and stick them together. My only major complaint is that the program doesn’t offer any built-in noise reduction to help clean up vocal tracks. (There's a denoising plug-in in Logic, but it won't learn room tone, and noise gates only hide noise in silence, not while people are talking.) Guests on my podcasts often record their ends of our conversations in noisy rooms in their houses, with computer fans or even air conditioners running in the background. There are third-party plug-ins that can reduce such noise. For example, iZotope’s RX2 does it well, but it costs $349. Logic competitor Adobe Audition (4 of 5 rating) offers basic built-in noise removal, and really, so should Logic. Is Logic Pro a good tool for podcast editors? Yes, in the sense that I use it and like it. No, in the sense that it’s not really made specifically for that task. Most of the new Logic Pro X features, such as the new drum features, are purely for musicians. The fact is, spoken-word editors like me form a tiny subset of the audio market. We generally need to appropriate existing music tools and make them our own as best we can. By that standard, I’d recommend Logic Pro X to a fellow podcaster who was become frustrated by GarageBand’s limitations and wanted to step up. The interface isn’t inviting, but it’s less off-putting than it was, and the features in Logic Pro X put GarageBand to shame. There are other options—my colleague Christopher Breen strongly prefers Adobe Audition for podcast editing, though I find it mystifying. For podcast editors who already use Logic Pro 9, I’m not sure the $200 upgrade is worth the money. The interface is better, but there really aren’t that many new features that spoken-word editors will care about. However, I do encourage podcast editors still soldiering on with GarageBand to consider upgrading to Logic Pro X. The learning curve is now a lot less daunting, and the extra features in Logic Pro X can be a huge productivity boost. There’s never been a better time to make that particular jump.